My name is Saho, a Japanese food ambassador. I throw Japanese food parties to introduce Japanese food. 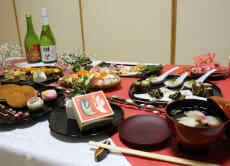 In my Japanese food parties, you can not only eat delicious Japanese food but also experience cooking. I love Japanese food and think that Japanese food is the most delicious food in the world. Not only that, but it is also healthy and photogenic. I want everybody to know that Japanese food is the best food. That is why I started the food parties. You can learn how to cook Japanese photogenic food and experience traditional tea ceremony.